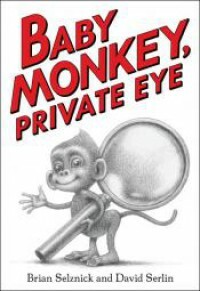 I had just Googled when Brian Selznick's next book was coming out when Baby Monkey, Private Eye came in our shipment at work. The title hadn't shown up in my Google search (possibly because the author is credited as David Serlin, Selznick's husband?). I checked it out immediately and was not disappointed. The story is very cute and the illustrations are full of visual allusions (which are explained at the back of the book). I don't know if there are plans for more Baby Monkey books, but if there are I'll definitely be checking those out too.